This simple dish ticks lots of boxes when it comes to satisfying hunger pangs, and only takes 20-25 minutes to make. 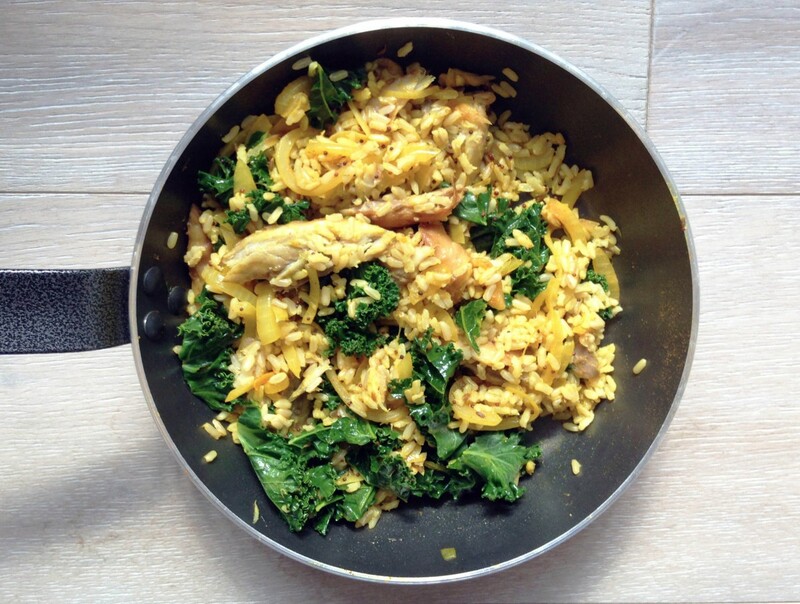 A kedgeree is often thought of as breakfast here in the UK, but here we add a few nutritious greens and ramp up the spiciness to turn it into a substantial main course. It’s quick, it’s easy, it’s filling … but most importantly it’s delicious. Fish, eggs, and brown rice are all foods which keep you feeling full, and oily fish is also a crucial source of omega 3 which is great for the heart. Using spices to create big flavours is another trick to keep hunger at bay for longer, and a teaspoon amounts to just 8 calories. If you’re keeping a close eye on your salt intake, swap smoked mackerel out for an unsalted variety of fresh fish. Start to cook the brown rice according to the instructions on the pack. After five minutes, heat a teaspoon of oil in a frying pan, and cook the sliced onion at a low heat for 6-8 minutes. You want it to turn soft and clear, rather than browning. Increase the heat, and add the mustard seeds to the frying pan. When they start to pop, add the chilli powder and turmeric. Stir for a minute or so to make sure the onions are coated in all of the spices. Add 50 ml of boiling water to the pan along with the kale leaves, so they steam quickly in the spiced water. Remove the skin from the smoked mackerel and tear up the mackerel into bite sized chunks. Put into the pan along with the cooked brown rice, and stir until any water has evaporated. Serve in a shallow bowl with a halved or quartered boiled egg. 1 big frying pan for the rest.